For the first destroyer of this class encountered by GTVA forces, see SD Kismat. 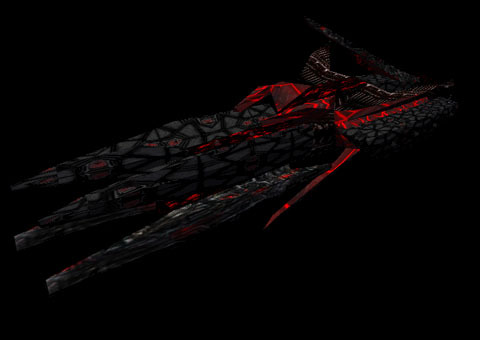 The Kismat is a destroyer class based on the SD Ravana seen in FreeSpace 2. The Shivan Kismat-class destroyer is a strong opponent, but is only moderately well-armed. This destroyer has no fighterbay to speak of, instead relying on her own AAA and rapid fire laser turrets for defence. The first Kismat to appear was quickly destroyed by the GTCa Independence, but not before she did immense damage to the carrier. Her two forward beam mounts are heavily shielded, unlike her supposed predecessor, the SD Ravana. The Kismat is an anti-fighter destroyer with many long range Shivan weapons. Although its heavy cannons are relatively useless at their maximum range, they still provide an effective deterrent when escorting other fleet assets. Like all other Shivan destroyers, the Kismat has powerful forward beam weaponry that can easily destroy all but our heaviest destroyers when facing off one-on-one. Never attack a Kismat's from the port side - the concentration of its heavy turrets is localized there. Warships or heavy bombers will be dispatched to deal with these targets since their turrets are so lethal. HTL version from Inferno Nostos is much more dangerous due to additional two beam cannons under standard pair of main beams. This page was last edited on 6 December 2018, at 11:11.